Director – Doug Lefler, Screenplay – Jez Butterworth & Tom Butterworth, Story – Carlo Carlei, Valerio Massimo Manfredi & Peter Rader, Based In Part on the Novel by Valerio Massimo Manfredi, Producers – Tarak Ben Ammar, Martha De Laurentiis & Raffaella De Laurentiis, Photography – Marco Pontecorvo, Music – Patrick Doyle, Visual Effects – Duboi (Senior Supervisor – Alain Carsoux), Special Effects Supervisor – Trevor Wood, Makeup Design – Giannetto De Rossi, Production Design – Carmelo Agate. Production Company – Dino De Laurentiis Company/Quinta Communications/Ingenious Film Partners/Zephyr Films/Carthago Films/Kolika Production & Services/Empire Productions. 460 A.D. The soldier Aurelius Antonius and his legionnaires have been recalled back to Rome. Aurelius stops a young boy who tries to steal his sword but afterwards finds that the young boy is Romulus Augustus who is about to become the new Caesar. As Romulus is crowned, Aurelius and his troops are appointed his personal bodyguard. Rome is then invaded by Goth hordes and their leader Odoacer proclaims himself emperor. Rather than slaughter Romulus, Odoacer sends him into exile on the island of Capri. Aurelius saves his legionnaires from execution and together they travel to Capri and rescue Romulus. They are joined by Romulus’s tutor, the old man Ambrosinus. Ambrosinus believes in the power of a legendary sword that a great leader will come to claim. Romulus follows the trail of the sword’s pentacle symbol to find its hiding place on Capri. With nowhere in the Roman Empire left to take refuge, Aurelius realises that their destiny lies in Britannia. Odoacer’s lieutenant Wulfila pursues them in order to recapture Romulus and joins in an alliance with the British warlord Vortgyn. Gathering together the last of the Roman troops who were stationed in Britannia and are now living as peasants, Aurelius and his men make a stand at Hadrian’s Wall. The Last Legion is an historical epic from the legendary movie mogul Dino De Laurentiis. The film had a complicated genesis. Sometime in the early 00s, Dino De Laurentiis brought in Italian celebrity archaeologist Valerio Massimo Manfredi to come up with the script, along with Carlo Carlei, the Italian director of Fluke (1995), and Peter Rader, the American co-writer of Waterworld (1995). When the production encountered problems, Valerio Manfredi went away and adapted the story into a novel The Last Legion (2002). Dino De Laurentiis then returned to the project in 2005, buying up the novel and adapting it (although doing so liberally enough for Valerio Manfredi to insist on a ‘Based on in Part’ credit). With a $67 million budget, an international cast and location shooting in Slovakia and Tunisia, The Last Legion seemed set to be a box-office success. Unfortunately for Dino De Laurentiis, The Last Legion was greeted by mediocre reviews and poor box-office reception. The Last Legion has been mounted as a modern historical epic in the vein of recent efforts such as Gladiator (2000), The Patriot (2000), Troy (2004), Alexander (2004), Kingdom of Heaven (2005), Apocalypto (2006) and Tristan + Isolde (2006). Although the film that The Last Legion resembles the most is King Arthur (2004), which took an historical (as opposed to mythological) view of the legends of King Arthur and made Arthur into a Roman legionnaire. The Last Legion similarly ties the Arthurian legends to an historical setting and concerns a Roman legion who defy the empire and make siege in Britain. The surprise about The Last Legion is just how much of its story does fit into the historical record. Romulus Augustus was the last emperor of Rome, who was a child when he was crowned. After only one year as emperor, Romulus was deposed by the invading Goth Orestes who crowned himself emperor and sent Romulus into exile. Conveniently for the film’s purposes, the historical record remains silent as to what happened to Romulus after he went into exile. Director Doug Lefler, whose previous film was Dragonheart: A New Beginning (2000) also produced by Raffaela De Laurentiis, does well with the sword-fighting action on Capri and the climactic battle scenes. The Last Legion is not a film that burns with deep analysis of the socio-historical conditions or profound subtext, it is simply a reasonably well put together historical epic, no more than that. The film’s entire budget certainly shows up on screen. Clearly, Dino De Laurentiis intended The Last Legion to be seen as an epic, although sometimes it topples with the self-consciousness of doing so. One of the more amusing things about the film is the backgrounds, which have been digitally retouched to include the maximum number of historical ruins. It seems at times that almost every shot in the film has a giant statue, an aqueduct, an ancient building or, when the film arrives in England, a dolmen or the stretch of Hadrian’s Wall set obtrusively in its background with an insistence that one look at it and be impressed. This becomes slightly absurd when Colin Firth takes a nap on his route and we see him lying against a giant stone hand while the giant head of a statue lies in the river beside him. Of course, what concerns us here is the film’s gradual shift from an epic about rogue Roman legionnaires and the story of the last emperor to morph into the beginnings of the Arthurian legends. There is a conceptual ingenuity to the way that the film merges these two stories. Technically, The Last Legion is not an Arthurian tale in itself, more like a prologue to the main story. This does not stop Doug Lefler from throwing in numerous pseudo-Arthurian images – or at least shots that consciously evoke Arthurian associations. When Colin Firth dives into the water at Capri, he pointedly emerges with a sword in one hand, while Aishwarya Rai’s appearance out of the water by the riverside seems intended to evoke imagery with the Lady in the Lake. The last shot of the film follows the sword as it is thrown through the air and impales in a stone where we watch moss grows across it, covering the Caliburnus and other letters to spell ‘Escalibur’. The epilogue then tells us how Romulus became Uther Pendragon, Ambrosinius Merlin and so on. All of this sits between conceptual pseudo-historical ingenuity and the punchline to a shaggy dog story. The film has a reasonable name cast. Colin Firth is adequate without being standout and turns his boyish good looks towards serious heroism. 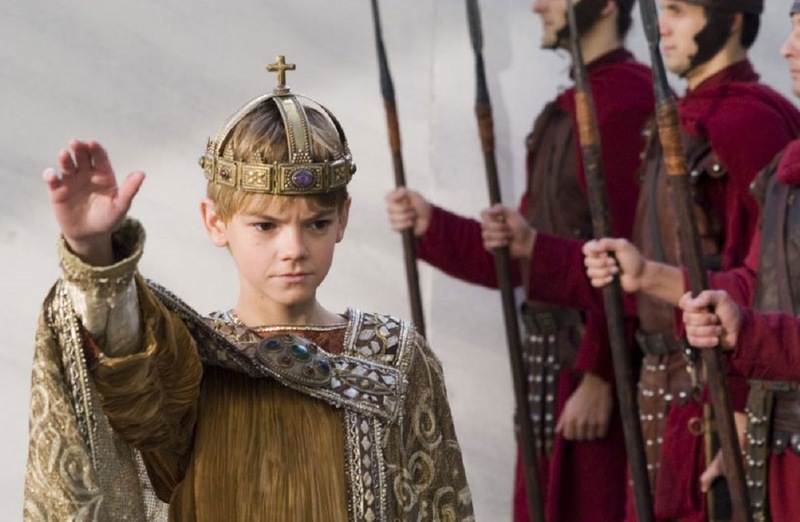 One of the best performances comes from Thomas Sangster as Romulus, which Sangster plays with just the right inner strength – you can see the qualities of the leader coming through in him. Indian actress Aishwarya Rai has great presence, not to mention some lithe moves once she gets into the swordfight scenes. She is someone who deserves a film all to herself – alas, after the scenes in Capri she becomes fairly much part of the scenery without much purpose in the plot. The least convincing performance comes from Ben Kingsley as the wise man who is supposed to become Merlin. This is one of those roles that Kingsley deigns to do every couple of years to maintain his paycheque between serous acting – the last time he did this was in Uwe Boll’s BloodRayne (2005) and before that A Sound of Thunder (2005).